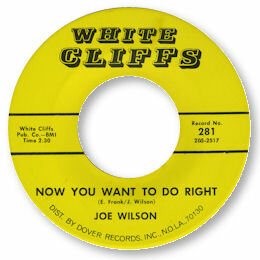 Joe Wilson was born on 5 May 1943 and was gigging around the New Orleans clubs from the beginning of the 60s. His first records were released by White Cliffs, a subsidiary of Cosimo Matassa’s Dover distribution company. Of the three 45s Wilson had on the street the best were the two deep soul ballads Now You Want To Do Right and I Want To Love You. The former has some lovely harmony vocals and an impassioned lead, while the latter is even better. An absolute belter of a song with great chord changes complete with a really heartfelt vocal from Joe and a big big horn section. Lovely. 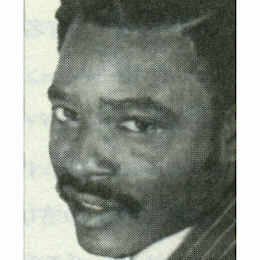 Sadly when Dover collapsed in 1968 Wilson was left without a record company with several other titles still in the can, as so many other New Orleans artists were. Help came from Wardell Quezergue who took Joe to Malaco in 1970, one of a seemingly endless number of NOLA singers he ferried to Jackson after the huge success of his first visit there with Jean Knight and King Floyd. And their first collaboration was an immediate artistic success. When A Man Cries is an exquisite deep soul ballad, brim full of emotional power from Joe’s light high baritone and featuring one of Wardell’s most heartfelt string arrangements – superb guitar fills as well. Tommy Couch licensed this to Musicor/Dynamo on a trip up to New York after both Stax and Atlantic had passed on it. The song got a second chance a couple of years later when it came out again as Musicor 1501. 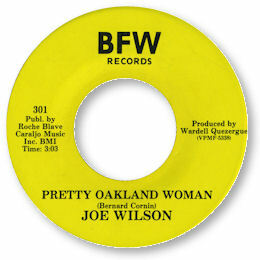 A couple of years later Joe recorded another superb cut at Malaco. 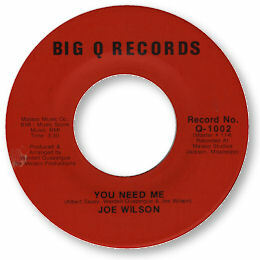 You Need Me is a track of great beauty, featuring one of Joe’s most impassioned performances inside perhaps the lushest set of horns and strings that Wardell ever brought to a studio. Maybe the stories about him writing out charts for 75 strings for an Aaron Neville track with just a tuning fork for assistance are true! Wilson reunited with Wardell for a 45 in 1980 featuring a rather discofied uptempo cut “What Would I Do” and the more subtle and funky “Pretty Oakland Woman” with its pronounced Caribbean slant before recording his first album for Burnell Moliere’s RIA in 1987. “Come Inside” was a fine set, almost a throwback to the 70s in feel, using real (and very expert) musicians together with the usual quality Wardell arrangements. The gentle island sound of “Sugar Is Sweet” was very catchy, as was the strong beat ballad title track. But perhaps the cream of the crop were the fine “Touch Me”, and the two tracks that formed the only 45 taken from the LP, the melodic “Family Man” and the recut of his masterpiece “You Need Me” which retained all of the charm of the original. Until recently Joe was reported to be still gigging around the Crescent City but since the Katrina disaster nothing further has been heard about him sadly. "When a man cries" and "Let a broken heart come in" can be found on the Kent UK CD "When a man cries" (CDKEND 176). These two tracks plus "(Don't let them) blow your mind", "Sweetness", Your love is sweet (to the very last drop)", "Other side of your mind", "Our love is strong", "Sour love bitter sweet", "Don't look back", "Go on and live", "Nothing from nothing", "Walking away from a true love" and an extended version of "You need me" can be found on the Soulscape CD "Malaco Soul Brothers Vol 1" (SSCD 7017).